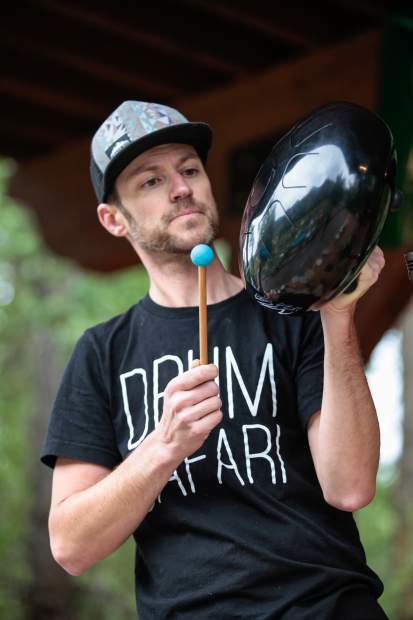 Brandon Draper plays a Handpan drum during Drum Safari's performance for the Education Foundation of Eagle County's annual School of Rock camp Tuesday in Minturn. 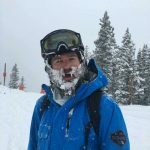 MINTURN — Feel the rhythm, feel the rhythm, feel the beat. It’s learning time. The Education Foundation of Eagle County is back with its annual summer camp of music, School of Rock. This year, however, Drum Safari treated the students and other audience members to a special performance. Made up of Brandon and Teryn Draper, with their two daughters, Eva and Ivy, the group promotes interactive music “edu-tainment,” Brandon said. Based in Kansas City, Missouri, Brandon is a music professor at the University of Kansas and Teryn is a 17-year first-grade teacher. The two have developed the curriculum to teach younger children about music and more. The family teaches kids the importance of saving the environment and being a better member of the community through the exploration of music. Bringing percussion instruments from around the world, they teach kids history as well as how to hold a beat. Tying animals into their safari program, each animal has a unique rhythm associated with them. Elephants, toucans and jaguars combined to make a melody. But it isn’t only beats and rhythms the kids are taught. Eva, the Drapers’ oldest daughter, said the family and students make up rhythms to remind the kids of a better world and a way to teach them about endangered animals. The Drum Safari program wouldn’t have been possible without the grant from the town of Minturn. During camp, kids also learn yoga, art and activities other than music to simulate their minds and bodies. Camp proceeds benefit Eagle County Schools and other music programs around the Vail Valley. The camp is going on its sixth year and aids mathematical abilities while playing ukulele. Scholarships are also available for campers.